There are no spoilers in this writing, read without worry. 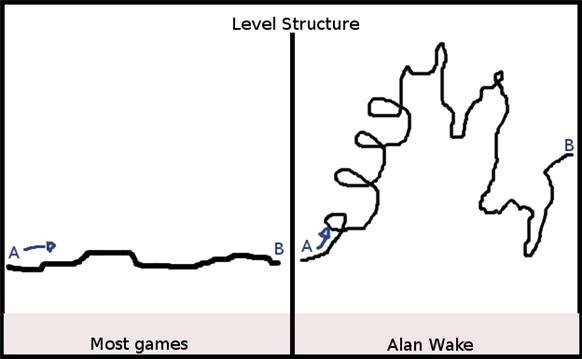 Finished Episode 3 of Alan Wake yesterday, impressed by different reasons. I originally bought the game for the possibility of great story, dialogue, and voice acting. That part of the game has been disappointing. What has stood out from playing episodes 1 to 3 is the level design and game play. The game consistently changes the pace and the methods of actions available to keep things fresh. In episode one, the player is introduced to basic game play of the flashlight and the gun. In episode two, the flare is introduced, giving the player more strategic ways to fight. This is important because it also allows the game to throw more enemies at once at the player without it being overwhelming. Episode two also has a section where you work together with someone against "The Taken", the shadow enemies of the game. In that section, the player shines the light on the enemies while the other character shoots them. In episode three, the light grenade and inanimate monsters are introduced. The light grenade, officially called the lightgang grenade, blows up in a sphere of light after a few seconds of being thrown, killing any enemy within a short distance. Why do they call it a lightbang? Bang is such a crude word. I keep thinking gangbang so it's a little distracting. The grenade is very useful in small areas where you are surrounded by enemies. This additional weapon is not just something that is introduced and never used again. On our play through, we "banged" to our heart's content. The Lightbang Grenade and flying objects. Up to episode three, the only enemy encountered are the shadow figures called The Taken ( think of them as zombies). In this episode, objects also become possessed and lunge at you until you kill them with direct light. This is a nice addition because now the player must look around a scene and wonder what item might become possessed and attack. These items are fast and sometimes they appear along with the regular Taken for a harder challenge. We thought these items were a lot of fun and often looked forward to them. For a change of pace, the game doesn't keep the player running with the same parameters all the time. There are daylight scenes where things are less suspenseful. For a long time in the beginning of episode three, Alan Wake does not carry a flashlight or a weapon, defenseless the whole time. It was very interesting to survive a cop hunt and The Taken this way. There is a long daytime driving section where you can visit multiple empty houses and switch to the car of your choice to drive. This part I didn't quite get. It really was a long but useless section. The empty houses served no purpose or contained anything interesting and the extra cars are useless since you only need one. Even without a car, one could walk the entire section. The level design in Alan Wake keeps things visually stimulating. The environment in the levels are not flat areas where one progresses horizontally from point A to B, without any change in elevation. In episode three for example, Alan is trying to get to a mine, climbing up, down, and around mountain sides to achieve this goal. This makes the scenery and paths very interesting. In many games most goals lie on the same plane and often in direct lines to the next goal. GTA 4 for example, had some small hills here and there, but the whole city was virtually flat in terms of where you had to go and do. Red Dead Redemption is also guilty of this feature. You do go up and down terrain a bit, but most of it is on the level as everything else. 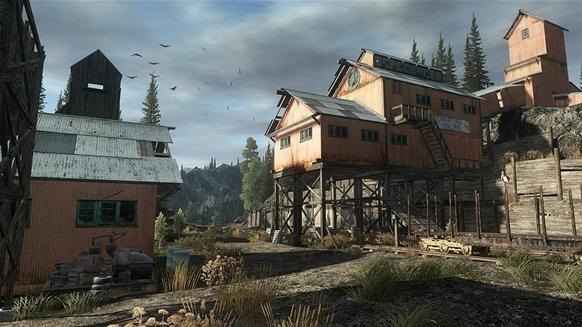 One game that did have exceptional vertical and horizontal level design was Call of Juarez: Bound for Blood. Having varied terrain elevations helps vary the game play, and makes it more fun for the player to go through. "This is Agent Nightingale, FBI. Get'em up Hemingway, you're under arrest. You move a muscle I'll unload right in your goddamn face!Stay right where you are - [shoots]"
The first mistake is to come off with a bad joke. "Get'em up Hemingway" is stereotypically corny, clever only in the town of Nowhere, Minnesota. At this point, the player reads the FBI character as a typical FBI prick. The next line just doesn't make sense. What kind of FBI anywhere makes a threat like that on their third sentence? Maybe if two five year olds where playing pretend would this type of childish line show up, but sadly it has surfaced here too. There is nothing wrong with having the FBI character as an aggressive type, but having him do it an uninspiring canny fashion gives a bad first impression. What made it worse is the voice acting. Maybe a good voice actor with good direction could have delivered these lines to be believable, but this voice actor makes it worse. If I close my eyes, it feels like I'm listening to some Saturday morning cartoon. The cut scenes are few so please don't take too much stock into it. Thankfully the game is mostly exploration and game play, where it shines.